The word ‘abstemious’ can be remembered with the help of one very simple tip: relate it to the ‘Buddha’ and the tenets of sects like ‘Buddhism’. These essentially convey to its follower that one needs to adopt a simple and austere way of life, with restrain being important virtue of one’s life. There are a few sects in this world which take this concept to the extreme and start to talk in terms of self denial. 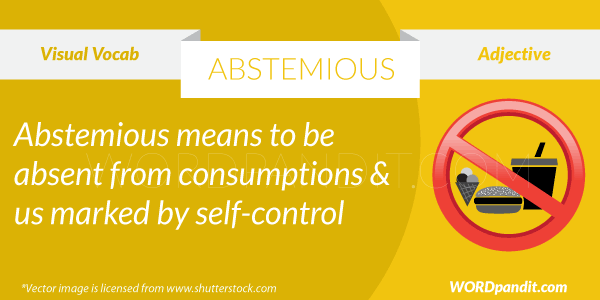 Abstemious is not one such extreme word but it does imply a moderation and avoiding of excesses. So the simple tip for this word: Abstemious equals to Buddha and the restrained way of life he preached. Sir, i think there is a spelling mistake in the above mentioned word (Abstemoius), kindly correct it. and one of the few words containing all the vowels that too in ascending order.